My next article for the Computer Corner in PN Magazine, due out July 1, focuses on choosing a laptop. In the piece I promised to share photos and information on my blog about the accessories I have chosen to make me 1) comfortable, 2) productive, 3) mobile, and nearly totally 4) independent. I start with a few photos and then I'll describe each attribute and the products that support it. If your are someone like me who has used a wheelchair for very long you sometimes end-up feeling like a shopping cart; everything lands on your lap. If it happens to frequently be a laptop computer you can find yourself lugging a heavy, fragile, and often hot piece of equipment. Solution: the ADA Lap, a universal system that simply slides under your wheelchair cushion. I like the product so much I decided to make them available here on my blog. The ADA Lap lifts off your lap the hot, heavy, and awkward objects you encounter throughout the course of daily life. For me productivity equates to connectivity. Around the house and in most work environments connecting to the World Wide Web is easily achieved via a wireless router (803.11b/g). I travel frequently though and find myself in meetings and lodging where either the network is closed to guests or requires payment. Solution: a Sprint Wireless Connection Data Card and services account. You'll need to size-up your computer and which solution works best for you, Sprint is not the only provider offering data cards and services, but I've been extremely happy with the USB style card and Sprint's network availability. This is not an inexpensive undertaking, but figuring that staying just three nights in a hotel and paying for an Internet connection can equal the cost of monthly service, not to mention the hours of vehicle travel that can now serve as work time, its a solution I find pays off. Connectivity isn't everything when it comes to working a full day online. Even just browsing the web and emailing, two rather simple tasks that do not require a lot of processing power, can drain a laptop battery in roughly 2.5 hours. Solution: a long-life external battery from Battery Geek. This too is not an inexpensive solution at $299; however, my choice of units extends my unconnected (to AC power) usage from 2.5 to over 8 hours and comes with a case that allows the unit to hang neatly behind my chair back. I found their staff very knowledgeable and responsive to my questions; check them out on the web at: www.batterygeek.net. This attribute isn't easily linked to one part of the system but represents to collective benefits of all the parts. That said, there's on accessory I haven't profiled yet that both supports firmly and allows independent adjustment of a laptop. Solution: the Targus Podium CoolPad which raises the back edge of your notebook to increase airflow, improving the cooling efficiency of your laptop. 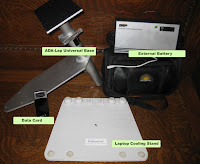 It also allows for a 360-degree rotation of your computer, making it ideal for small presentations, while the six small rubber pads on the bottom provide a tight grip, ideal for wheelchair travelers. And finally, this is an inexpensive part of the system at under $20; shop for them on the web at: http://www.google.com/products?hl=en&q=Podium+CoolPad&scoring=p. All in all I've been very happy with my choice of accessories. When I purchased the ADA Lap Base, I ordered an extra piece of Velcro Hook to secure the CoolPad. If you buy it here, see below, note that it will come with the Base Unit and 4"Velcro Hook for $195 (+ 7.25% sales tax if you're from CA); a savings of $21 over MSRP with S&H. Additionally, I'll donate $5 of each purchase to the Paralyzed Veterans of America.